No. 1 in the North! It is the largest office building in Manchester and the tallest-built in the city in the last 50 years and is a brand new world class business environment at the heart of Spinningfields. No.1 Spinningfields offers flexible office space combined with state-of-the art business facilities and some of the finest hospitality offerings in Manchester and is managed by All+ Management, an innovative and forward thinking operator specialising in large-scale, mixed-use commercial and residential developments across the UK, delivering high-quality facilities management, property management and customer experience to match the global vision of their clients’ properties and estates. With over 260,000 square feet of office accommodation and floor plates between 11,000 and 25,000 square feet, No.1 Spinningfields can readily accommodate and facilitate any business, of any size, from any industry. The tower is the centre-piece site at the heart of the most successful commercial district and most prominent estate in Manchester, easily offering the best arena for business outside of London. No.1 Spinningfields is also been home to Manchester’s most spectacular rooftop terrace bar and stylish contemporary restaurant, by D&D London, with elegant surroundings and stunning panoramic views across the city. 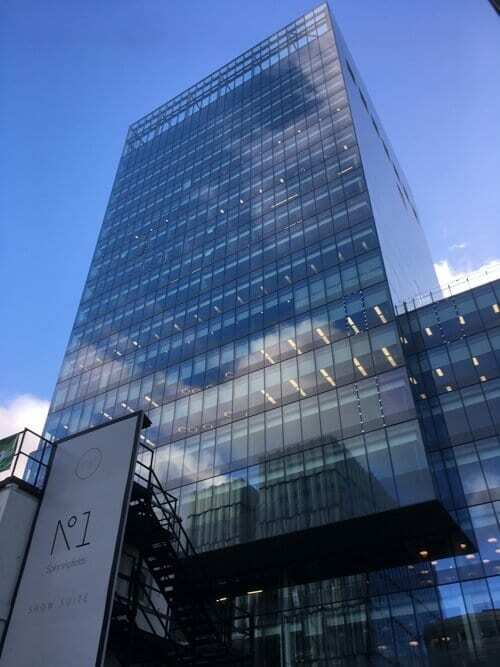 Aston Services Group is priviliged to have been entrusted with delivering daily cleaning, window cleaning, and customer service standards to enhance and complement the overall ethos of No 1 Spinningfields. No 1 Spinningfields is the centerpiece of Schroders UK property portfolio and as an A+ office environment, unrivalled outside of London, it has attracted some of the highest quality blue-chip companies such as PwC, Squire, Patton Boggs, Browne Jacobson & WeWorks. With such a high profile occupier base the building lives and breathes 24 hours a day and demands the highest possible standards on a daily basis. With this in mind Aston Services Group are continuously developing our service offering to meet the ever changing needs of the building as it reaches full occupancy and settles into a daily rhythm. This includes 24 hours a day coverage, the adoption of the Living Wage to attract and retain quality and committed operatives, innovative cleaning practices such as a predominantly chemical free approach, a rigorous auditing process and the adoption of other award winning technological innovations. Alistair Clayton, Commercial Director, commented ‘’Hugely proud, delighted, honoured are all words which sum up our thoughts in being associated and entrusted with this iconic building at the heart of Manchester. The on-going efforts of our on-site cleaning team and regional support management function are fundamental to the service delivery on site and their efforts must not go unrecognised as we strive to meet and exceed our clients expectations at this magnificent building”. *Aston Services Group working in partnership with ALL+ the Property and FM managing agents entrusted to manage the building for Schroders.